CREATIVE MEMORIES -Christmas/Wedding/Celebrations Stickers --- You Choose! Block Sticker approx 12.5 cm X 10 cm. 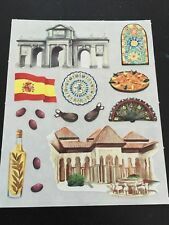 CREATIVE MEMORIES STICKERS TITLES PHRASES SUMMER FRIENDS VACATION SPRING U PICK! TTY Kit - HEARTS. This kit consists of:-. Bank account details can be obtained through checkout. Grossman's products (mainly retired products). STUDIO STICKER. This sticker is 12.5cm x 5cm in size. Studio Stickers. This sticker is 12.5cm x 5cm in size. Studio Stickers. This sticker is 12.5cm x 5cm in size. Bank account details can be obtained through checkout. CREATIVE MEMORIES STICKERS DIE CUTS CARD STOCK JOURNAL SETS TTY YOU PICK! NEW Creative Memories Studio Sticker - MERRY CHRISTMAS ! STUDIO STICKER. This sticker is 12.5cm x 5cm in size. Bank account details can be obtained through checkout. One Studio Sticker Strip. Blue with Gray Swirls. Due to photography exposure colors may be a little lighter or darker than shown in the picture. Mrs Grossmans. Sticker strip. Includes 1 sticker strip. CREATIVE MEMORIES STICKERS SPRING SUMMER FUN BEACH KIDS THEMES YOU PICK! Creative Memories Block sticker approximately 12.5 X 10 cm AS PICTURED Brand new but no longer in original packaging. Glistens the powder Decorative Stickers. Peel off from backing paper. Clean and dry surface with mild soap and water. The surface that is going to apply the cover sticker must be flat and cannot have any curve. Mrs Grossmans. Shiny Silver Jingle Bells Sticker strip. Includes 1 sticker strip. Creative Memories 1 studio sticker approximately 12.5 X 5 cm AS PICTURED Brand new but no longer in original packaging. Xmas squares. Block Sticker approx 12.5 cm X 10 cm.